Duma arsonists 'terrorists' trying to undermine the State, Bennett says, gives ISA benefit of the doubt over abuse allegations. Jewish Home chairman and Education Minister Naftali Bennett backed the Israel Security Agency (ISA or Shin Bet) Tuesday, despite the organization's alleged cruel and unusual interrogation methods in the Duma arson case. 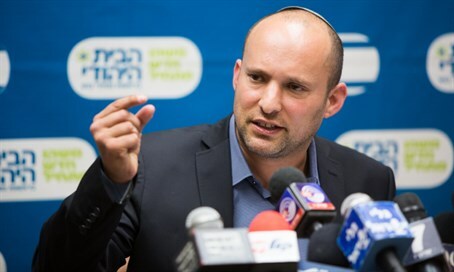 "What we see here is terrorism," Bennett stated about the Duma arsonists, in an interview with Army Radio. "There are a few dozen people here whose purpose is not to kill (per sa), but to undertake means to undermine the foundations of the state." "These people do not recognize Israel as a legitimate state, and really try to bring about Armageddon," he added. "We need to run the most harsh campaign against those people in order to catch the Duma murderers, and even more importantly - to prevent the next Duma," the minister explained, "because if we do not act, Duma will happen again." Bennett said that the security cabinet backs the ISA on the whole. "I get my information as a member of the Cabinet, which is the information that we receive from top officials, " he noted. "You have to understand that these people want to separate the country [of Israel] and the government, they want to create a kind of anarchy or something similar, and bring down upon us the state of Israel upon ourselves." "We just have to find and catch the Duma murderers as soon as possible and take care of this thing," he added. Bennett did however support Justice Minister Ayelet Shaked (Jewish Home)'s push to investigate the growing allegations against the ISA. "Our job is also to scrutinize the security systems and ensure that things are done as usual," he said. Despite this, Bennett then added that the ISA's alleged actions, if true, are justified. "I have heard many, many things, and I can announce that all the actions being taken are certainly unusual in light of it being an unusual situation," he continued, noting that they are part of efforts "to prevent the next attack." "We know we can rely on the ISA in other terrorism operations," he said. "The ISA is the one who protects us daily from hundreds of thousands of Palestinians terror attacks, we have to rely on the same ISA also here."